Halleluiah! I can’t believe I am even saying this but today M and I ran 5.91 miles! We decided to check out the rest of the trail and kept exploring and before we knew it we were past the San Jose International Airport. I ran almost the whole time but of course we had to stop a few times because I was winded. I also started getting very sore in my hip flexors at about the fourth mile which was something new but I guess expected for my first time. I am sure I will feel it tomorrow too. I definitely need to upgrade and get some new running shoes so if anyone has any recommendations please let me know! We started running around 9am and got back in just about an hour which was awesome. We beat the heat (it was 88 in San Jose today) and got back in time to grab a couple chairs down at the pool. It was a great day for my training and I seriously can’t wait to continue running faster and longer distances. I am actually really looking forward to it! And if you can’t believe it either, here is the proof! 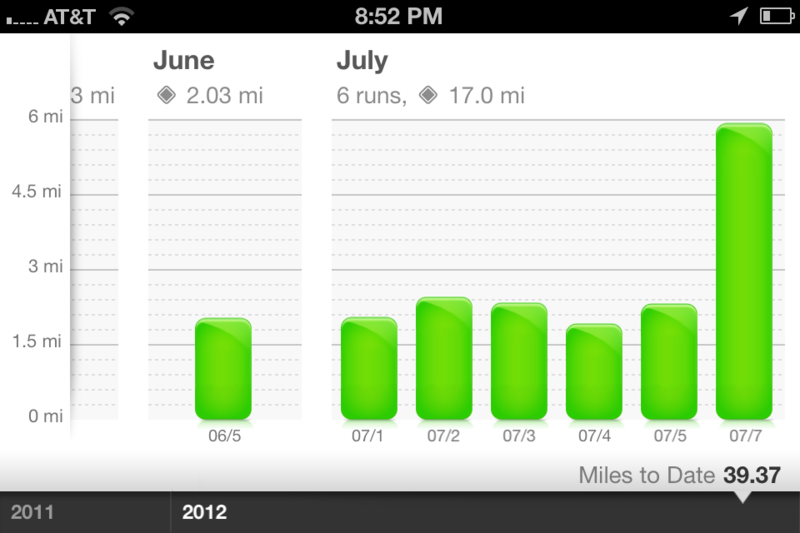 I am on a roll for July! I am getting pretty close….wouldn’t you say? Posted in Posts and tagged Athletic shoe, motivation, Muscle, running, Sport, Trail running, Training. Bookmark the permalink. OMG! I need this mileage calculator. (I also need to learn how to take screen shots of my phone screen.) This is super-inspiring. 6 miles! Whew! You’re awesome. thanks! It is the Nike + app. Just hold down the home button and the power button at the same time! Oh, I don’t have Nike+. Booooo. Maybe I should get it! Thanks! scratch that. It’s an app. Got it!